As it moves into the future, Mountain View draws on a rich heritage. The Memorial Park was incorporated in 1915 by James Richard Thompson. In 1942 his son J. Arthur Thompson added the funeral home on the cemetery grounds. At the time a revolutionary idea, it was only the second funeral home/cemetery combination started in the United States. In 1956, Arthur’s son, Brewer B. Thompson, came to Mountain View. Under his leadership, Mountain View continued to grow. 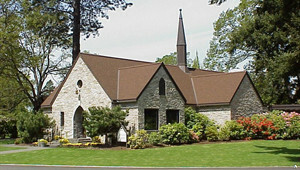 A second funeral chapel was built on the grounds, the operation was computerized, the staff grew in size to 68 full time employees, 80 more acres were acquired for the memorial park and the company became debt free. Brewer’s daughter, Cindy Thompson, started as manager at Mountain View in 1987 after a career in healthcare. While working at Mountain View, Cindy received an MBA from Pacific Lutheran University . She became President of Mountain View in 1996 after her father’s retirement. In 2000, Cindy built the Celebration of Life Center which includes the Aspen Chapel and two reception rooms. Seeing the need for Mountain View to grow beyond the family heritage from which it began, Cindy arranged for North Star Memorial Group to acquire the park and she continues to serve as a consultant for Mountain View. For nearly 100 years, Mountain View Memorial Park has been part of life for the people of Tacoma. Mountain View has 160 acres of property, 110 of which have been fully developed for cemetery use. The first burial took place in 1915 and since then more than 100,000 interments have occurred in the cemetery. The cemetery has about 1000 burials a year, and helps about 1400 families a year with funeral services. The cemetery continues to grow and is committed to preserving the beauty and peacefulness of the park. In the past few years we have developed an additional urn garden with over 3,000 inurnment spaces and another mausoleum structure, bringing the total of such structures to ten with over 5,000 casket spaces and over 10,000 niches for cremated remains. The cemetery also includes five veterans' sections and 53 other separate gardens for burial. Mountain View Memorial Park has an array of flora and fauna, including 181 different varieties of trees, 575 rhododendrons, and a prize winning rose garden and many varieties of birds and wildlife.